"...an extraordinary amalgam of technological sophistication and architectural wonder. 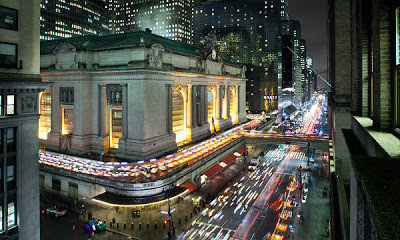 [...] It was -- and still is -- located at the very epicentre of midtown Manhattan on 42nd Street and Park Avenue [...] At the time of its construction, Grand Central was acclaimed as an engineering marvel. 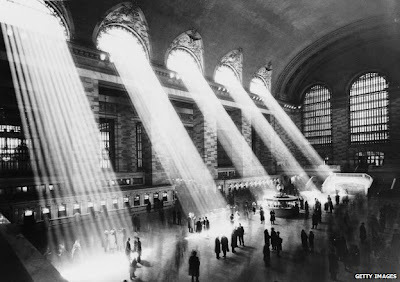 In the subterranean depths of Manhattan, a huge space was carved out, where trains could be boarded from platforms at two different levels, which were approached by gently sloping ramps rather than inconvenient stairs [...] Above ground there arose a spectacular beaux arts creation, all marble and chandeliers and sculpture and glass, the centrepiece of which was a huge and lofty passenger concourse, which drew the eyes of awe-struck passengers heavenwards, where they could marvel at a vast, barrelled ceiling, painted blue and decorated with the signs of the zodiac."